—Steven Strogatz is a mathematician at Cornell University. —George Sugihara is a theoretical biologist at the Scripps Institution of Oceanography. Thanks Pete for pointing out that there is modeling behind the Ryan proposal after all. Macroeconomic Advisers has the kind of in-depth scrutiny of the model results that I love, in The Economic Effects of the Ryan Plan: Assuming the Answer?. The simulation shows real federal non-defense purchases down by $37.4 billion in 2012, but real GDP up by $33.7 billion, so the short-run “fiscal multiplier” is negative. As noted above, that analysis was prepared using the GI model of the US economy. We are not intimately familiar with this model but have the impression it is a structural macro model in which near-term movements in GDP are governed by aggregate demand while long-term trends in output are determined by the labor force, the capital stock, and total factor productivity. Obviously we can’t object to this paradigm, since we rely on it, too. However, precisely because we are so familiar with the characteristics of such systems, we doubt that the GI model, used as intended, shows a negative short-run fiscal multiplier. Indeed, GI’s own discussion of its model makes clear the system does, in fact, have a positive short-run fiscal multiplier. This made us wonder how and on what grounds analysts at Heritage manipulated the system to produce the results reported. In sum, we have never seen an investment equation specified this way and, in our judgment, adjusting up investment demand in this manner is tantamount to assuming the answer. If Heritage wanted to show more crowding in, it should have argued for a bigger drop in interest rates or more interest-sensitive investment, responses over which there is legitimate empirical debate. These kinds of adjustments would not have reversed the sign of the short-run fiscal multiplier in the manner that simply adjusting up investment spending did. In our opinion, however, the macroeconomic analysis released in conjunction with the House Budget Resolution is not relevant to the coming discussion. We believe that the main result — that aggressive deficit reduction immediately raises GDP at unchanged interest rates — was generated by manipulating a model that would not otherwise produce this result, and that the basis for this manipulation is not supported either theoretically or empirically. Other features of the results — while perhaps unintended — seem highly problematic to us and seriously undermine the credibility of the overall conclusions. As a historical note, GI – Global Insight, maker of the model used by Heritage CDA for the Ryan analysis – is the product of a Wharton/DRI merger, though it appears that the use of the GI model may have been outside their purview in this case. What’s the cure? I’m not sure there is one as long as people are cherry-picking plausible sounding arguments to back up their preconceived notions or narrow self-interest. But assuming that some people do want intelligent discourse, it’s fairly easy to get it by having high standards for model transparency and quality. This means more than peer review, which often entails only weak checks of face validity of output. 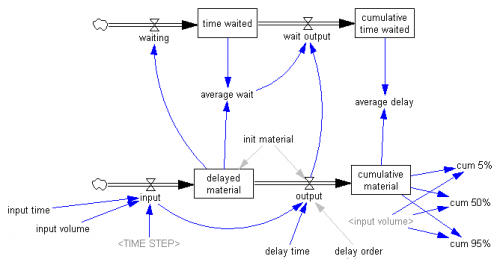 It means actual interaction with models, supported by software that makes it easy to identify causal relationships and perform tests in extreme conditions. It also means archiving of models and results for long-term replication and quality improvement. It requires that modelers invest more in testing the limits of their own insights, communicating their learnings and tools, and fostering understanding of principles that help raise the average level of debate. Eliminates the alternative minimum tax [AMT]. Promotes saving by eliminating taxes on interest, capital gains, and dividends; also eliminates the death tax. This ostensibly results in a revenue trajectory that rises to a little less than 19% of GDP, roughly the postwar average. The CBO didn’t analyze this; it used a trajectory from Ryan’s staff. The numbers appear to me to be delusional. For sub-$50k returns in the new 10% bracket, this does not appear to be a break. Of those returns, currently over 2/3 pay less than a 5% average tax rate. It’s not clear what the distribution of income is within this bracket, but an individual would only have to make about $25k to be worse off than the median earner, it appears. The same appears to be true in the $100k-200k bracket. A $150k return with a $39k exemption for a family of four would pay 18.5% on average, while the current median is 10-15%. This is certainly not a benefit to wage earners, though the net effect is ambiguous (to me at least) because of the change in treatment of asset income. The elimination of tax on interest, dividends and capital gains is really the big story here. For returns over $200k, wages are less than 42% of AGI. Interest, dividends and gains are over 35%. The termination of asset taxes means that taxes fall by about a third on high income returns (the elimination of the mortgage interest deduction does little to change that). The flat 25% marginal rate can’t possibly make up for this, because it’s not different enough from the ~20% median effective tax rate in that bracket. For the top 400 returns in the US, exemption of asset income would reduce the income basis by 70%, and reduce the marginal tax rate from the ballpark of 35% to 25%. It seems utterly delusional to imagine that this somehow returns to something resembling the postwar average tax burden, unless setting taxes on assets to zero is accompanied by a net increase in other taxes (i.e. wages, which constitute about 70% of total income). That in turn implies a tax increase for the lower brackets, a substantial cut on returns over $200k, and a ginormous cut for the very highest earners. This is all exacerbated by the simultaneous elimination of corporate taxes, which are already historically low and presumably have roughly the same incidence as individual asset income, making the cut another gift to the top decile. With rates falling from 35% at the margin to 8.5% on “consumption” (a misnomer – the title calls it a “business consumption tax” but the language actually taxes “gross profits”, which is in turn a misnomer because investment is treated as a current year expense). The repeal of the estate tax, of which 80% is currently collected on estates over $5 million (essentially 0% below $2 million) has a similar distributional effect. I think it’s reasonable to discuss cutting corporate taxes, which do appear to be cross sectionally high. But if you’re going to do that, you need to somehow maintain the distributional characteristics of the tax system, or come up with a rational reason not to, in the face of increasing inequity of wealth. I can’t help wondering whether there’s any analysis behind these numbers, or if they were just pulled from a hat by lawyers and lobbyists. This simply isn’t a serious proposal, except for people who are serious about top-bracket tax cuts and drowning the government in a bathtub. 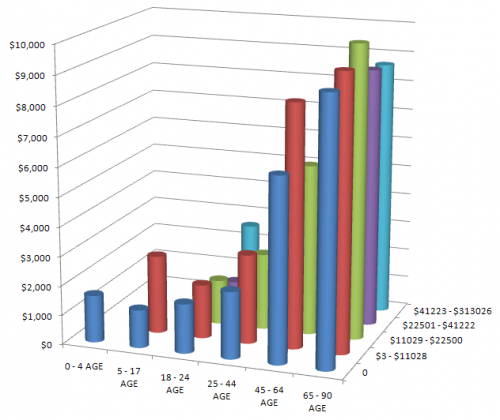 Given that the IRS knows the distribution of individual income in exquisite detail, and that much of the aggregate data needed to analyze proposals like those above is readily available on the web, it’s hard to fathom why anyone would even entertain the idea of discussing a complex revenue proposal like Ryan’s without some serious analytic support and visualization. This isn’t rocket science, or even bathtub dynamics. It’s just basic accounting – perfect stuff for a spreadsheet. So why are we reviewing this proposal with 19th century tools – an overwhelming legal text surrounded by a stew of bogus rhetoric? “This is an agreement to invest in our country’s future while making the largest annual spending cut in our history,” Obama said. However, it seems that there isn’t really much substance to the deal yet, so I thought I’d better look instead at one target: the Ryan budget roadmap. The CBO recently analyzed it, and put the $ conveniently in a spreadsheet. Like most spreadsheets, this is very good at presenting the numbers, and lousy at revealing causality. The projections are basically open-loop, but they run to 2084. 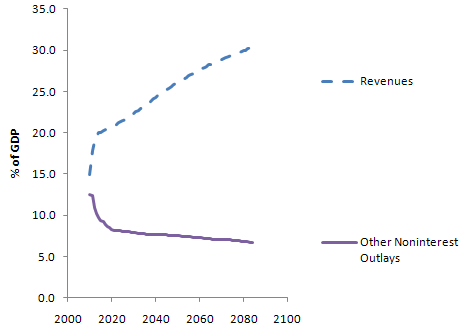 There’s actually some justification for open-loop budget projections, because many policies are open loop. The big health and social security programs, for example, are driven by demographics, cutoff ages and inflation adjustment formulae. 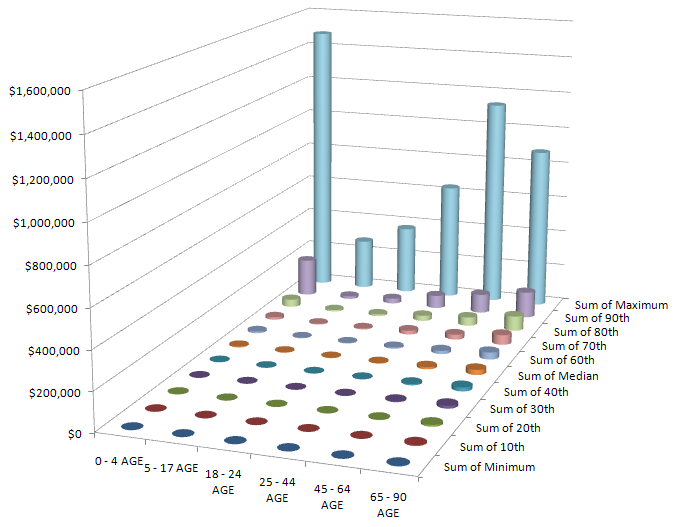 The demographics and cutoff ages are predictable. It’s harder to fathom the possible divergence between inflation adjustments and broad inflation (which affects the health sector share) and future GDP growth. So, over long horizons, it’s a bit bonkers to look at the system without considering feedback, or at least uncertainty in the future trajectory of some key drivers. There’s a huge transient in each, due to the current financial mess. (Actually this behavior is to some extent deliberately Keynesian – the loss of revenue in a recession is amplified over the contraction of GDP, because people fall into lower tax brackets and profits are more volatile than gross activity. Increased borrowing automatically takes up the slack, maintaining more stable spending.) The transient makes it tough to sort out what’s real change, and what is merely the shifting sands of the GDP denominator. This graph also points out another irritation: there’s no history. Is this plausible, or unprecedented behavior? One reason the Federal Government’s major entitlement programs are difficult to control is that they are designed that way. A second is that current congressional budgeting provides no means of identifying the long-term effects of near-term program expansions. A third is that these programs are not subject to regular review, as annually appropriated discretionary programs are; and as a result, Congress rarely evaluates the costs and effectiveness of entitlements except when it is proposing to enlarge them. Nothing can substitute for sound and prudent policy choices. But an improved budget process, with enforceable limits on total spending, would surely be a step forward. This proposal calls for such a reform. Unfortunately the proposed reforms don’t seem to change anything about the process for analyzing the budget or designing programs. We need transparent models with at least a little bit of feedback in them, and programs that are robust because they’re designed with that little bit of feedback in mind. Setting aside these gripes, here’s what I can glean from the spreadsheet. 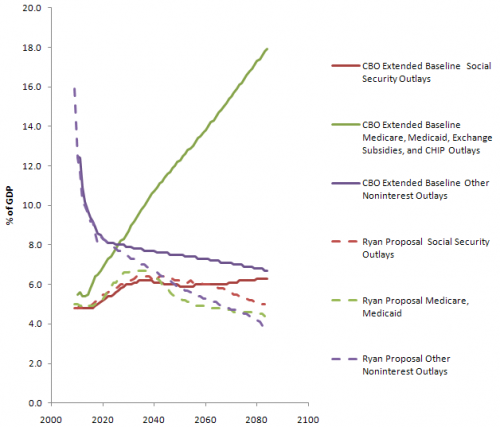 The Ryan proposal basically flatlines revenue at 19% of GDP, then squashes programs to fit. 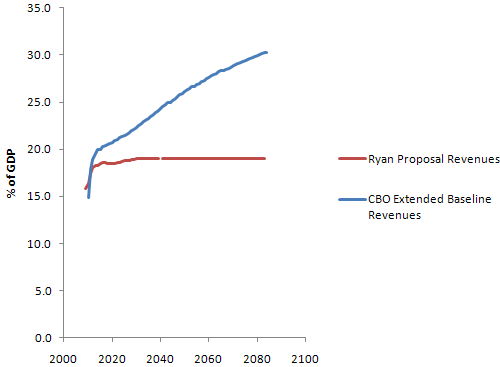 By contrast, the CBO Extended Baseline scenario expands programs per current rules and then raises revenue to match (very roughly – the Ryan proposal actually winds up with slightly more public debt 20 years from now). Provides individual income tax payers a choice of how to pay their taxes – through existing law, or through a highly simplified code that fits on a postcard with just two rates and virtually no special tax deductions, credits, or exclusions (except the health care tax credit). Simplifies tax rates to 10 percent on income up to $100,000 for joint filers, and $50,000 for single filers; and 25 percent on taxable income above these amounts. Also includes a generous standard deduction and personal exemption (totaling $39,000 for a family of four). Replaces the corporate income tax – currently the second highest in the industrialized world – with a border-adjustable business consumption tax of 8.5 percent. This new rate is roughly half that of the rest of the industrialized world. It’s not clear that there’s any analysis to back up the effects of this proposal. Certainly it’s an extremely regressive shift. Real estate fans will flip when they find out that the mortgage interest deduction is gone (actually a good idea, I think). 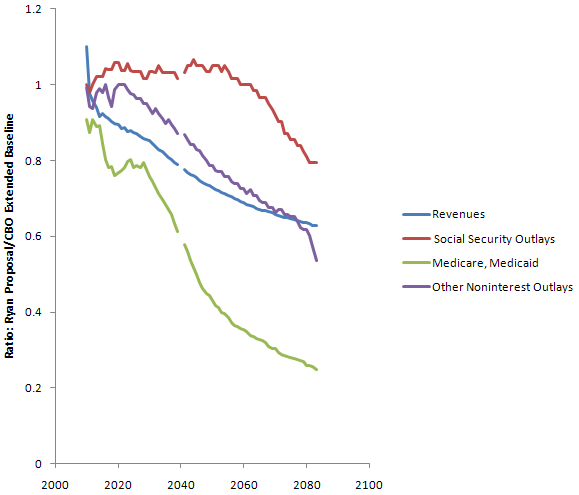 Social security is untouched until some time after 2050. CBO says that the proposal doesn’t change the program; Ryan’s web site partially privatizes it after about a decade and “eventually” raises the retirement age. There seems to be some disconnect here. Health care outlays are drastically lower; this is clearly where the bulk of the savings originate. Even so, there’s not much change in the trend until at least 2025 (the initial absolute difference is definitional – inclusion of programs other than Medicare/Medicaid in the CBO version). Other noninterest outlays also fall substantially – presumably this means that all other expenditures would have to fit into a box not much bigger than today’s defense budget, which seems like a heroic assumption even if you get rid of unemployment, SSI, food stamps, Section 8, and all similar support programs. Since health care carries the flag for savings, the question is, will the proposal work? I’ll take a look at that next. This set of models performs a variant of a Polya urn experiment, along the lines of that described in Bryan Arthur’s Increasing Returns and Path Dependence in the Economy, Chapter 10. There’s a small difference, which is that samples are drawn with replacement (Bernoulli distribution) rather than without (hypergeometric distribution). I tried the Polya urns experiment over lunch. We put 5 red and 5 white legos in a bowl, then took turns drawing a sample of 5. We returned the sample to the bowl, plus one lego of whichever color dominated the sample. Iterate. At the start, and after 2 or 3 rounds, I solicited guesses about what would happen. Gratifyingly, the consensus was that the bowl would remain roughly evenly divided between red and white. After a few more rounds, the reality began to diverge, and we stopped when white had a solid 2:1 advantage. 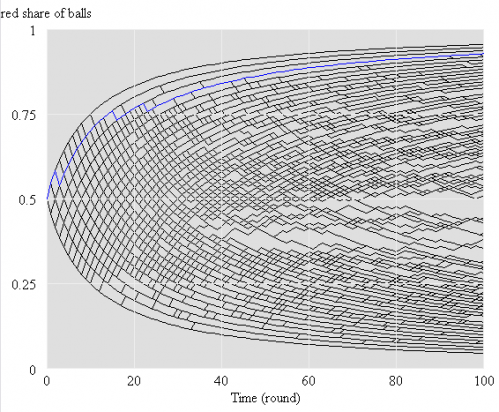 I wondered aloud whether using a larger or smaller sample would lead to faster convergence. With no consensus about the answer, we tried it – drawing samples of just 1 lego. I think the experimental outcome was somewhat inconclusive – we quickly reached dominance of red, but the sampling process was much faster, so it may have actually taken more rounds to achieve that. There’s a lot of variation possible in the outcome, which means that superstitious learning is a possible trap. This model automates the experiment, which makes it easier and more reliable to explore questions like the sensitivity of the rate of divergence to the sample size. In remaining Gallatin County, 263 out of 42,576 distinct owners (less than 1%) could block zoning, but my calculations are incorrect because of missing data and the presence of Bozeman in the middle, but the truth is probably not too different from the calculations above. In fact, the table above understates how dramatically this legislation moves toward a principle of “one acre, one vote.” First, represented “owners” in each district aren’t necessarily people; corporations and trusts get a vote in zoning protests too. Second, non-landowners are completely disenfranchised, even though as residents and citizens they still have an interest in land use policy. We the People Landowners of the United States, in Order to form a more perfect Union Subdivision, establish Justice, insure domestic Tranquility Profitability, provide for the common aristocracy’s defence, promote the general Welfare Subservience, and secure the Blessings of Liberty Property to ourselves and our Posterity, do ordain and establish this Constitution for the United States of America, LLC. I hope that there is in fact some valid underlying intent to SB379. My guess is that it’s fear of a fairness issue: that the rabble will acquire their small lots, then seek to use zoning to lock up all land remaining in large undeveloped parcels, to preserve views and resources. So far, this is a strictly theoretical problem. County commissions, and a lot of MT voters, are a conservative lot, which militates against such developments, and agriculture and forestry are protected from zoning anyway. If there’s any real need for policy here, surely there is a means to achieve it that doesn’t do such violence to democracy. If the real goal is to create a de facto zoning ban, by making it impossible to create districts or amend regulations, then the legislature should simply de-authorize zoning. But, following the wingwalker’s rule (don’t let go of one thing until you’ve got hold of another), they should first come up with an incentive system that achieves the purposes of zoning more flexibly. An asteroid has been discovered sharing earth’s orbit, with a horseshoe-shaped orbit (from an earthbound reference frame). Near-Earth asteroids are common but SO16 is in a category of its own. 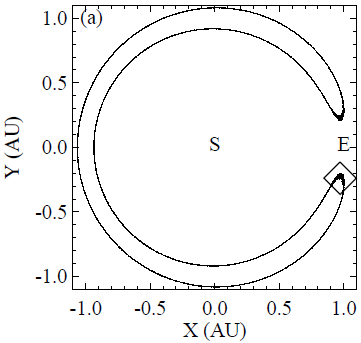 First and foremost, it has an exotic horseshoe-shaped orbit (see diagram above) which astronomers believe to be very rare. 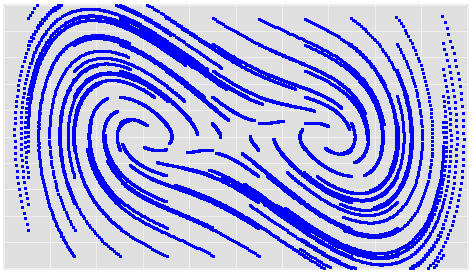 Its worth taking a few moments to think about horseshoe orbits. Two points are worth bearing in mind. First, objects further from the Sun than Earth, orbit more slowly. Second, objects that are closer to the Sun orbit more quickly than Earth. So imagine an asteroid with an orbit around the Sun that is just a little bit smaller than Earth’s. Because it is orbiting more quickly, this asteroid will gradually catch up with Earth. When it approaches Earth, the larger planet’s gravity will tend to pull the asteroid towards it and away from the Sun. This makes the asteroid orbit more slowly and if the asteroid ends up in a orbit that is slightly bigger than Earth’s, it will orbit the Sun more slowly than Earth and fall behind. After that, the Earth will catch up with the slower asteroid in the bigger orbit, pulling it back into the small faster orbit and process begins again. For SO16, the period of this effect is about 350 years. Even simple systems like the three-body problem can yield analytically intractable and surprising solutions, but this is the weirdest I’ve yet seen (and the competition is stiff this week). It even inspires poetry in the comments.